After a dominating 46-point win over in-state rival, Louisville, Kentucky finished the regular season with nine wins for the first time since 1977. 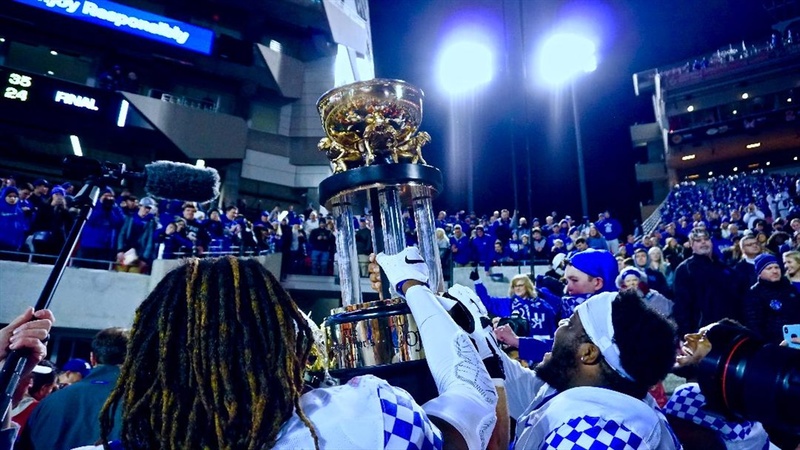 Now, as the Cats wait to see their bowl destination, we have an opportunity to reflect on the historical season Mark Stoops and his team delivered. Kentucky had plenty of “highs” this season, so let's take a look at the best. The Most Valuable Player award goes to Benny Snell. Snell has entered a rare territory, joining some guy named Herschel Walker as the only SEC players to rush for over 1,000 yards and more than 13 touchdowns in each year prior to their Senior season. Snell capped off an incredible career, as this will likely be his last season in blue, carrying the football 263 times for 1,305 yards and 14 touchdowns. Snell was truly the most valuable asset to the Wildcats. Kentucky had a stagnant offense for most of the year, but who knows what it would have been like without their star running back. This was really no surprise, but Bowden has lived up to the hype he had coming into Kentucky. Of his five touchdowns, three were over 20 yards and two were over 50 yards. That’s not including his 67-yard punt return late in the fourth quarter against Missouri. Bowden was Terry Wilson’s biggest weapon all season long, and five of his six touchdowns came in wins. Bowden was Wilson’s favorite target all season. Bowden separated himself from the other wideouts, getting open consistently all year long. On a big 3rd and long in Gainesville against the Gators, Wilson threw the prettiest pass he threw all season long, connecting with Bowden for a 54-yard touchdown to silence the Swamp, going up 21-10. The Mississippi State Bulldogs have the best defensive line in the country. Jeffrey Simmons and Montez Sweat lead the group, and they will both have their names called in the first round of the 2019 NFL Draft. The Bulldogs led all of FBS in fewest touchdowns allowed, allowing only 12 all season. Four of those touchdowns were Benny Snell. The defense didn’t play great in the first half, but in the second half, they were unreal. The Tigers, who averaged near 37 points this season, were held to zero points in the second half. Drew Lock and the high-powered offense had eight second-half drives, and all eight resulted in a three-and-out. Missouri was held to 14 points at home, which is 23 points below their average. A miraculous victory to end a streak that looked endless. The 27-16 win showed everyone Kentucky was for real this season, as they dominated on both sides of the ball. This is a win no one will forget, and a staple when looking back on this historic season. The amazing return of a true sophomore, Josh Paschal. Paschal was out for the first ten games of the season due to melanoma in his foot. In Week 11 against MTSU, Paschal returned, going out on the field and making a tackle. Kroger Field rumbled for one of the best moments of the season. Bouvier replaced Charles Walker as well as he could. The Senior had 15 catches for 205 yards and two touchdowns this season. Most of his catches were in clutch moments, the highlight of his season was a 29-yard touchdown catch to set the tempo in the Swamp. West had a better stat sheet in 2017, but stats don’t show how big West came up. He had three interceptions, one was a clutch pick in the Swamp. West also had a big fumble recovery for a touchdown in College Station to force overtime with Texas A&M. His play all season was exceptional. He paired up with Mike Edwards was a special duo to watch at safety. We have to credit Kash Daniel, an in-state recruit that waited for his time to shine. He didn’t play much in his first two years, but taking over the middle linebacker spot this season, Daniel played well. Kash also brought something to the defense that the stat sheet didn’t show. Kash Daniel was the heart and soul of the defense. Players listened when he spoke, and he became one of the biggest leaders on the team. He brought the defense the attitude that they played with. Daniel was a huge part in the best defense Kentucky football has ever had. Kentucky took care of business over in-state rival, Louisville, to cap off the historic season. One of the more emotional wins in Kentucky football history, as they rolled over the Cardinals, 56-10. The first nine-win regular season since 1977 was finished off with a dominating performance. We must give credit where credit is due. A 9-3 season shows that Stoops has officially completed the turnaround at Kentucky. The Wildcats are no longer a pushover. Stoops has made the program a relevant threat in the SEC East. Kentucky has improved every season under Stoops, and the future looks bright. Stoops should win SEC Coach of the Year award because the turnaround he has made is incredible. He should also have some names called in the 2019 NFL Draft, which puts Kentucky’s football program even more-so on the map.